Portable and detachable, you can take photo with your devices at any time anywhere Work on most type of mobile phones that are not bigger than 13mm diameter. Cell Phone Camera Lens Kit Apexel 5 in 1: Wide Angle+ Macro+Fisheye+Telephoto+CPL for iPhone Camera Lens, Samsung Camera Lens, and most Smartphone Camera Lens. 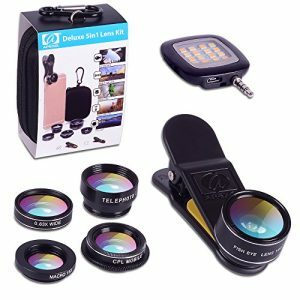 Take and share your unique photos with these hot sale Apexel DG5 5 in 1 mobile camera lenses. The mobile lens clip is well designed for most smartphone camera lens such as iPhone camera lens including iPhone 5s camera lens, iPhone 6 camera lens, iPhone 7 camera lens, and Samsung Galaxy phone lens, etc. 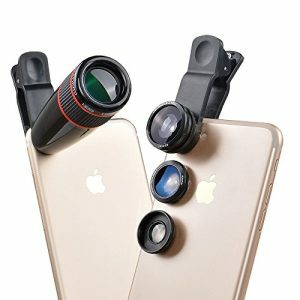 All the cell phone lenses and the clip can easily fit into a small handbag. Compared to phone built-in lens, the 0.63x cell phone wide angle lens can exaggerate the depth, size and distance of both near and far-off objects, and give you a bigger area into focus which is perfect for shooting many types of scenarios, from landscape to large groups of people. 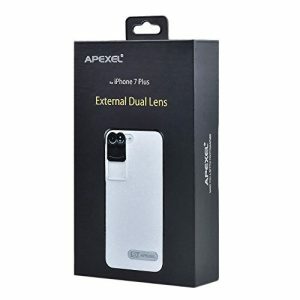 The CPL cell lens can remove reflections from water, or sometimes make the blue sky dark. The 15x macro smartphone lens can capture close-ups of tiny subjects and make the shallow depth of field while the phone built-in lens can’t. Practices may be needed for focusing on a subject, with a beautiful blurred foreground and background.